How can I manage my team members? How to add, remove, promote and demote team members. 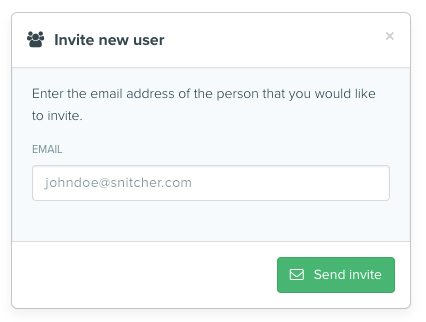 Here, you’ll be able to invite new users via email as well as manage your list of existing team-members, allowing you to promote, demote or even remove them at your leisure. Their respective ranks and dates of when they last logged-in to Snitcher can also be viewed here. Note: you can only promote or demote team members if you have admin permissions. Newly invited users cannot be promoted until they've accepter their invite. Admin users have access to the Team's billing settings, as well as the ability to promote/demote and remove team members. If a team members is not currently an admin, a 'X' will be displayed under the 'Admin' column. You can click the 'Upgrade' text next to the X icon, to promote the user to admin. If a user is already an admin, you will see a checkmark icon under the 'Admin' column. To demote the user to non-admin, click the 'Demote' text next to the checkmark icon. Note: you can only remove other team members if you have admin permissions. In order to remove a team member, you can click on the blue 'X' icon on the far right of the team member's profile, in the team members table.